YES!!! After missing it the last time, I was prepared to miss it again this time because I kept forgetting to buy the tickets and next thing I knew its near the opening show! Then one day I happened to chance upon a contest held by KiasuParents and decided to try my luck. 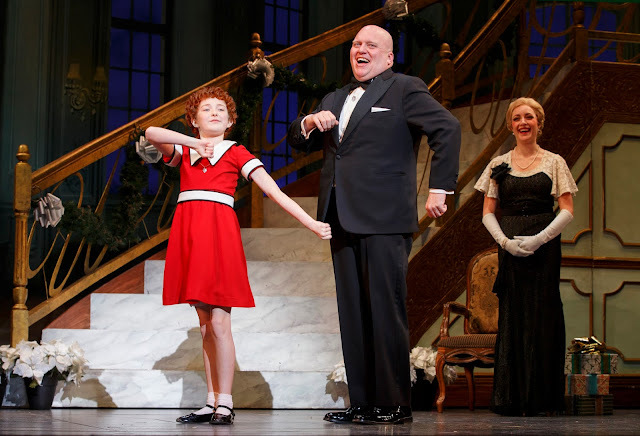 I entered the contest and forgotten about it (yes, you people know I have goldfish memory so don't roll your eyes at me) until they sent me an email congratulating me for winner a pair of tickets to watch Annie, the musical! Woohoo!!! I was so so happy! So happy that I have forgotten the tickets for our show is in the middle of DinoBoy's CA2 exam with Maths paper the next day... my heart sank and had a discussion with DinoPapa, who think its Okay to go since there isn't much we or the boy can do to "learn more", a night of relaxation might probably help him. And so here we are, sitting inside The MasterCard Theatres at Marina Bay Sands. In case you are wondering why am I so excited about this musical, this is because it is one of the biggest Broadway musical hits ever! The original production opened on 21 April, 1977 at the Alvin Theatre where it ran for 2,377 performances before closing in 1983. The show dominated the Tony Awards that year, winning seven awards in total including Best Musical, Best Book (Thomas Meehan), Best Original Score (music by Charles Strouse and lyrics by Martin Charnin), and Best Choreography . It also won the New York Drama Critics Circle Award for Best Musical, seven Drama Desk Awards including Best Musical, and the Grammy for Best Cast Show Album. It has since been performed in 28 languages and has been running around the world for 37 years. The classic film musical was released in 1982. This successful musical was based on Harold Gray's popular comic strip Little Orphan Annie. The comic strip premiered in the 1920s in the New York Daily News, and became one of the most widely read strips in the 30s and 40s. Lyricist-director Martin Charnin bought a coffee table book called “The Life and Hard Times of Little Orphan Annie” as a Christmas gift for a friend in 1970. The clerk at the bookstore was too busy to wrap the book, so Charnin took the book home to wrap it. Instead, he read it and fell in love with the strip, and set out to secure the rights, Christmas week of 1970. Of course the friend never got the book hahaha! For a musical that is so famous and successful, there are no special effects, no wowzer acrobatic stunts, no glamorous bling bling costumes (unless you consider Lily's colorful dress one) in this musical. 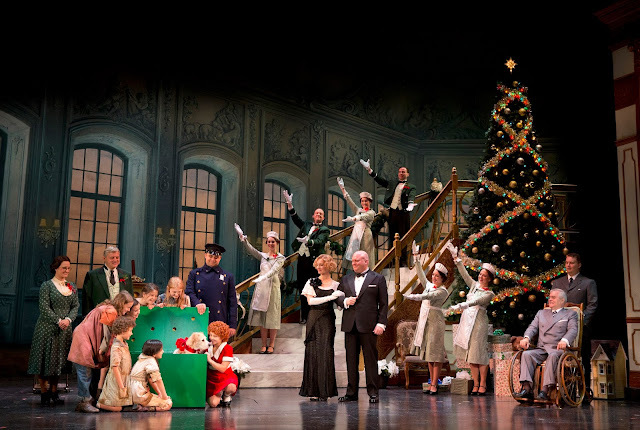 Instead you have simple backdrops and props that rotates to show the orphanage, the streets of New York City, Mr Warbucks home & office, and the presidential office. Simple does not mean unglam or boring. Simple can speaks a thousand words too. I personally feel that these props managed to replicate the years of economic slump of the story. Set in the Great Depression era, things were looking pretty gloomy and sad, every one's unemployed and life is pretty hard and harsh. One particular 11 year old girl lived in Ms Hanningan's New York City Municipal Orphanage with 6 other orphans, believing one day that her parents will be back to take her home. Apparently, tired of waiting and also of the nasty Ms Hanningan, Annie decided to run away from the orphanage in search of her long lost parents. Well, her little escapade didn't last long, she was soon caught and brought back to that dreaded orphanage where a turn of event awaits her. I absolutely love Annie or Heidi Gray, who's tremendously strong vocal brings out the positive energy of optimism when she was singing Tomorrow. I felt myself drawn to her and believing with her that every thing is not as bad as it seems and really, Tomorrow will definitely be better. 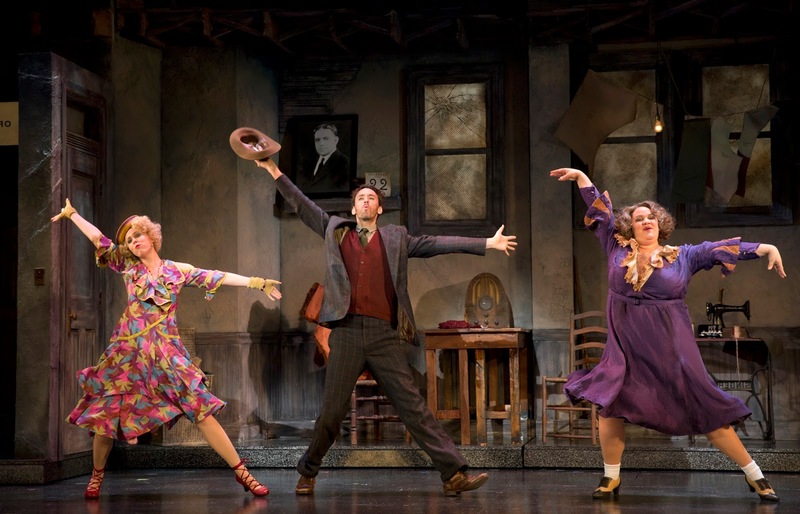 As much as I love Annie, I have my heart for these 2 characters too as they injected some comical acts and laughter in the otherwise gloomy-set musical. Ms Hanningan is a disgruntled orphanage matron who dislike her job and is ever ready to show it with her every moves, words and by the way she treated the orphan girls; working them hard on chores etc. She is always drunk, holding a bottle of liquor in her hand which she told the orphan girls that "it is medicine". Lynn Andrews has successfully portrays every thing about Ms Hanningan PLUS her exaggerating facial expressions, dance moves and acts makes Ms Hanningan seriously funny and almost loveable too. When Garrett Deagon first made his appearance swag walking onto stage, I find him peculiar, then I found the answer and soon I found out the reason. It's his slim build body with arms and legs that seems too long to be proportionate with his body (no offence there Garrett). Garrett play Rooster Hanningan, Ms Hanningan's sleazy, cunning, despicable brother. This over confident sly character is one you might see during that era, who is ready to jump into any given opportunity to swindle some money from any one. Garrett successfully brings out the character even when he's doing the dance scenes. He's such a remarkable dancer who's dance moves are sleek with a hint of cunning in it, long lanky limps and all. I admit that I went with high expectations, in anticipation of perfect performance, knowing well that I risked getting slapped in the face with the unbearable pain of disappointment... BUT this IS consider one of the most successful musical thus the risk. And I was spared!. 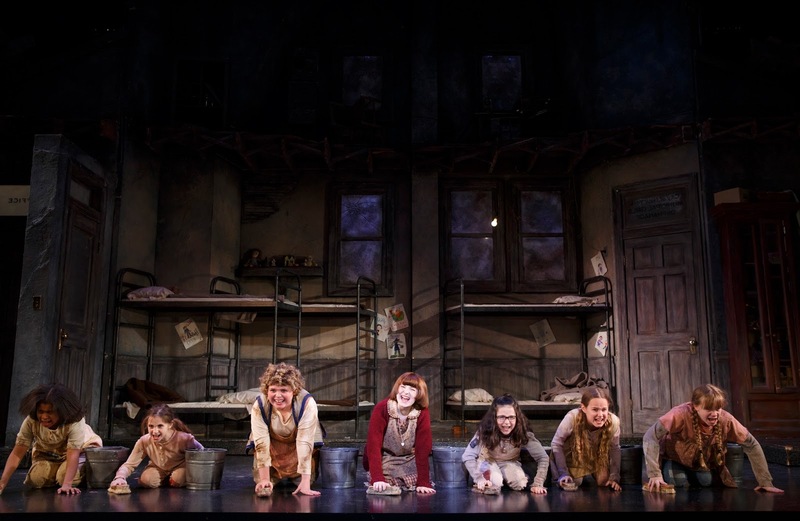 The strong international cast in Annie delivered a wondrous performance! I know others watching the performance with me agrees with me too because they gave a standing ovation to the cast at the end the performance. Bravo! Bravo! We enjoyed the musical performance and its score that includes "Maybe", "It's the Hard Knock Life", "You're Never Fully Dressed Without a Smile", "Easy Street", "I Don't Need Anything But You" and the eternal anthem of optimism, "Tomorrow". 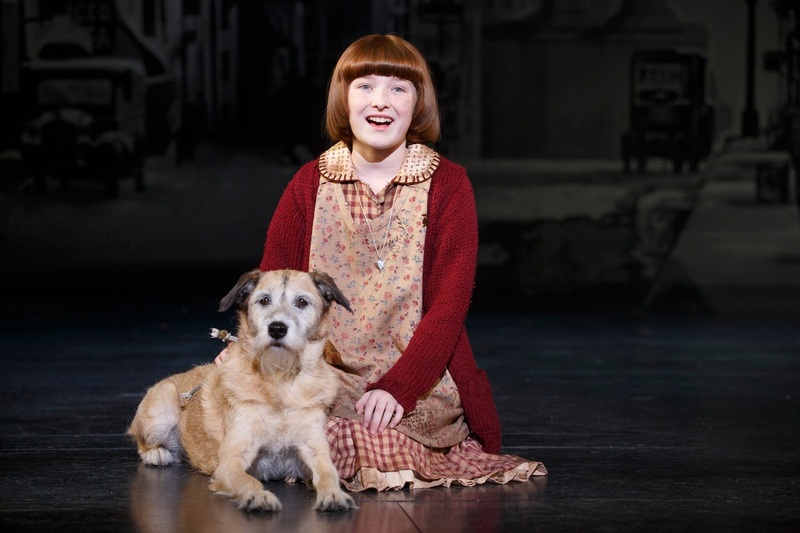 Every one will love Annie, the Musical for its heartwarming story about family, hope and optimism. So don't think twice any more, grab your tickets (if there are any left), some tissues and enjoy the great performance! Disclaimer : We won the tickets from KiasuParents contest but decided to to share our experience watching Annie, the Musical on our own accord. However, we got in touch with their PR company to request for some media info and photos. All photos in this post belongs to The DinoFamily and Annie, the Musical, you may not take it for personal use unless you seek permission from us. I didn't quite like our local version of "Sandy" coz he/she looks a bit distracted and too alert, like eyes darting every where expecting to flee at the slightest "danger". Maybe its the 1st performance so he/she's kinda wary.